Don’t panic! You woke up only to find that many of the leaves on your marijuana plant had turned yellow overnight! Here’s what you need to do to get your plant back on track. First of all, there are a variety of nutrient deficiencies that can cause cannabis leaves to turn yellow. The two most obvious being Calcium and Magnesium deficiencies. But before you run off to the store to buy some nutes you should continue reading so you can properly diagnose what’s going wrong with your plant. First of all, how many weeks old is your plant? It is completely common for marijuana to turn yellow during the final weeks of the flowering stage. Why? Well because your plant is literally dying. In its mind it’s fall outside, and just as the leaves on the trees turn colors and fall off, the same goes for cannabis. Another thing that happens during flowering is that all of the nitrogen that’s been going to your leaves, is now being sucked away by those giant buds you’ve been cultivating! Again, there are multiple opinions on how to deal with this problem, with the majority of people simply saying to let it go, and flush the plant of its final nutrients before harvest. However, if you really want to keep your plant nice and green then a Nitrogen deficiency could be what’s occurring. Check this video to see what you need to do if this is the case. It should be noted, that if your plant is still in vegetative state, and your leaves are yellowing, then a nitrogen of magnesium deficiency is probably the two most likely factors. In this video you can go over the reasons why this may be the case. Removing Yellowing leaves. 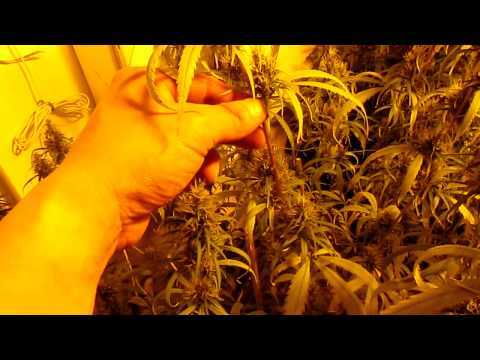 Pruning a plant is really up to the individual, some people swear by it, others not so much, but if you do want to remove the yellow and dying leaves you should first (in my opinion) wait a few days to see if you can green up your plant again by getting some nutes in it. If that fails, then this video shows you clearly how to remove those unwanted leaves. If these things don’t help your plant in a week (meaning if you don’t see improvements) then I’d make sure that your water is PHd correctly. If it isn’t you may be experiencing nute lock which means the plant is unable to absorb the nutrients that you’re giving it. Take a look at what Jorge says, and stay educated and hopefully you’re plants gets well soon! Next Why does weed make food taste better?